Albuquerque and Santa Fe have had water conservation programs for well over a decade, and both have been very successful. Yet their approaches to saving this precious resource in the arid Southwest are different. What lessons can we learn by comparing these cities? Both have made tremendous strides in conserving life-giving water. Since 1995, Albuquerque has reduced per capita use by 36%, Santa Fe by 42%. Santa Fe’s water use is now substantially less than the US average, while Albuquerque is likely to fall below the US average soon. 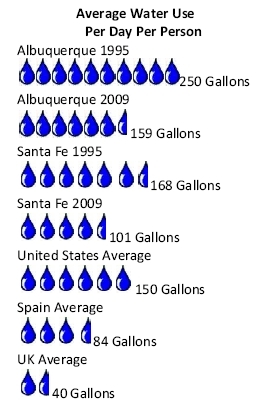 But Santa Fe and Albuquerque have very different water usage numbers. 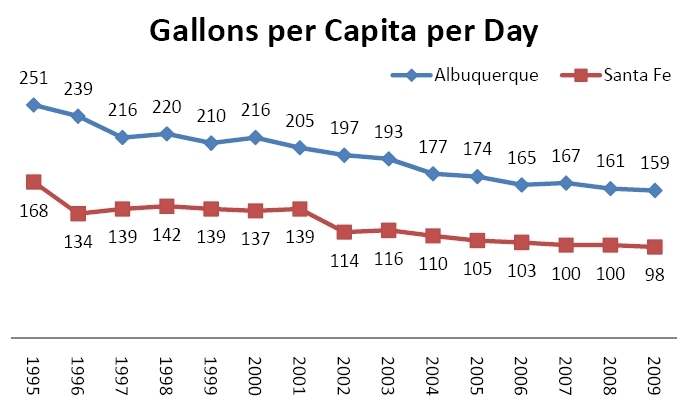 Albuquerque started off with much higher per capita water use (250 gallons compared to Santa Fe’s 168 gallons in 1995). Currently, this city just 60 miles south of Santa Fe uses almost 60 gallons more per person per day. How can this be? Those few miles make a big difference in climate, precipitation and watering season. Albuquerque’s average summer temperature is 6 degrees warmer than Santa Fe’s, and it has on average about 5” less annual rainfall and a growing season that is 2 months longer; consequently it is no surprise that the area uses about 40% of its annual water consumption for outdoor use while Santa Fe uses just 14%. This difference, coupled with the fact that Albuquerque needs more water for industrial and commercial customers, accounts for the base water difference (159 gallons versus 101 gallons per person per day). Despite these differences, both cities should be commended for their significant reductions. Albuquerque’s water agency, the Albuquerque Bernalillo County Water Utility Authority, is jointly owned by the city of Albuquerque and the county of Bernalillo. The agency started its water conservation program in 1994, and estimates that more than 155 billion gallons have been saved since then—enough to serve the entire area population for 4.5 years. The program has changed year-to-year, but its core elements — consumer and business awareness — have been relatively constant. Katherine Yuhas, Water Conservation Manager, firmly believes that awareness programs are the number one reason the Water Authority has been so successful. “We started an outreach program that included TV, radio and billboards, and saw an almost immediate drop in use,” she stated. “Consumer awareness and involvement has to be a cornerstone of any program.” The water authority’s school outreach program was recently expanded from the elementary schools to the middle and high schools. Since the implementation of these programs, Albuquerque’s base water rates have increased by more than 60% ($0.623 per every 749 gallons in 1997 to $1.104 in 2010). All these changes together have had an enormous impact. In 1996, Albuquerque had one of the highest per capita water usage rates in the Southwest, according to the Urban Groundwater database. This was partly blamed on having one of the lowest base water rates in the US. The water utility subsequently raised rates and moved away from a flat rate structure to a tiered structure, rewarding low water users, and moving more of the cost onto high water users. Rates are now based on seasonal use with a benchmark of the winter (December through March), and summer rates based on a multiplier of the average winter water usage. Of note, residential customers enjoy a 12% discount on their base water charge if their usage between April and October is no more than 50% greater than their average winter usage. However, big summer water users (i.e., residential customers who use more than 11,220 gallons) could see their water rates double. Additionally, the Water Authority can increase rates up to 300% during periods of drought. Two other notable aspects of Albuquerque’s program that you won’t find in Santa Fe, are comparative usage data printed in the monthly water bills and mandatory use of non-potable water for irrigation. Recent studies have shown that providing water users information on how their use compares to their neighbors’ drives use down. Albuquerque prints this data on every monthly water bill. As non-potable water lines are installed throughout the city, more businesses and residences will be required to use this water for irrigation. This will save water as well as reduce the customers’ bills, since non-potable water rates are about 20% lower. The Sangre de Cristo Water Division, owned by the city of Santa Fe, started its aggressive conservation program in 1995 as a result of a severe drought. At the time, Santa Fe’s primary water source was the reservoir nestled in the beautiful eastern foothills. Fifteen years later, many aspects of this program remain, including outreach to both residents and businesses to raise awareness, rebate programs, the mandated toilet retrofit program, and tiered water rates. Implementation of the program has changed. For example, the city’s rain barrel program that provided residences free rain barrels was switched to a rain barrel rebate program. Santa F e’s outreach includes inserts in water bills, posters in restaurant restrooms, flyers and a very popular and creative annual poster awards program for kids (e.g a great example is the award winning poster by Matthias Dietrich on the right). Water prices are another factor driving conservation. Since 1995 Santa Fe base water rates have gone up more than 50% for summer use and more than 100% for winter use (based on 9,000 gallons per month usage and no meter charges or taxes). According to the City, these programs have saved more than 20,000,000 gallons. Of note, the City also has had a mandatory toilet retrofit program in place since 2002, which has replaced approximately 44,000 inefficient toilets and saved (so far) more than 1,000,000 gallons of water. Although this program has been controversial with some builders, it has involved the building community in saving water. In 2009, the City adopted a Green Building Code that encourages, but does not require, water conservation. The City is working on a Green Commercial Building Code that will hopefully include mandated water conservation targets. Albuquerque publishes a scorecard on the city website which includes Water Usage. At this time, Santa Fe’s Sustainability Plan includes water conservation and its Long Range Water Supply Plan includes conservation, but as of yet the city has not established any published tracking method or long-term water conservation goal. Both cities have far to go to approach the levels of water use in other westernized countries. Close inspection reveals the rate of water savings has leveled off in recent years — Santa Fe dropping only five gallons in the last four years and Albuquerque dropping just six gallons in that time. Albuquerque has higher fines. Santa Fe, on the other hand, is less aggressive in its outdoor water use rebate programs, although outdoor watering can reach up to 40% of water use during short peak summer months. Major water users are exposed annually in the Santa Fe Reporter. There is no new supply of water. Many cities are looking to purchase and pipe water from further and further away at higher and higher costs. While these approaches provide short-term solutions, long-term sustainability requires conservation and being more efficient with what we have. It is possible? 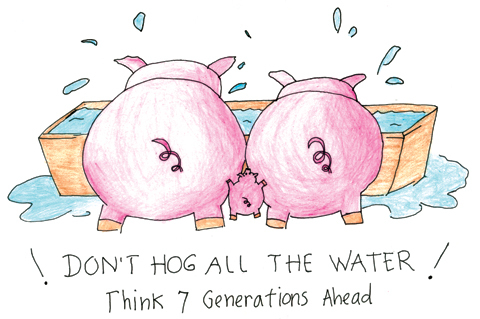 Spain has a comparable rate of 84 gallons per capita and the UK uses just 40 gallons per person. As writer Thomas Friedman recently elegantly stated, the only way it will happen is if the government puts some sticks on the table — not just carrots. Driving down usage requires aggressive education, rebates and incentives, but it must also include mandates and long-term targets — fundamental signals to businesses and residents that water conservation is the cornerstone to a city’s sustainable growth and long-range economic development. Please help conserve our most precious resource. The solution starts with each of us doing what we can.